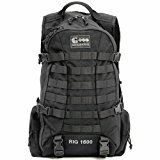 The idea behind this page is to present a line-up of hiking backpacks which, although not exactly belonging to the tactical class, are some of the sturdiest and best backpacks for hiking out there from all points of view. Depending on the purpose of your buying of a daypack, you’ll want to know details about it. If you’re looking for a daypack for hiking, that already implies a couple of assumptions: first, it’s a daypack. A daypack is a backpack that’s not too large, say up to 30-40 liters in volume, able to fit your gear for a day or two. Second, it’s a daypack for hiking, which already implies a certain build sturdiness and specialized functionality. 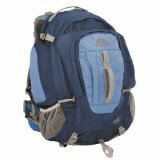 You may also be looking for a hiking-grade daypack, but for everyday use or for traveling. You have also come to the right place, since most of the daypacks we’re presenting have the proper organization, with laptop and tablet pockets, and plenty of storage for books, documents, equipment, and everything else you may want to carry. As a side note, any of the hiking daypacks listed below can last you for years to come. See also the 30-Liter version. Loops for trekking pole and ice axe. See also the 34-Liter version. Single aluminum stay and frame sheet. See also the 32-Liter and the 50-Liter version. See also the 32-Liter version. Hydration system w/ 3L bladder included. See also the newer NV model. See also the popular 1100 cu.in. model. 25L capacity (more sizes available). Shape-forming backer board for internal frame. Lashing for ice axes and hiking poles. Ice axe and hiking pole loops. Harness, hip belt and torso sizes specific for women. Expanding front pocket fits a helmet. Hydration bladder+tube and raincover included. If you’re determined to get a daypack for hiking but you’re not willing to pay much, play it safe with a pretty good option like the G4Free Ultra Lightweight Packable Backpack Hiking Daypack. The backpack is a cute looking surprise and may handle some trips for a good amount of time. It’s made with water and tear resistant materials, presenting reinforcement in 14 places through the rope Process. The zippers are made with durable abrasion resistant SBS material and run quite smooth. 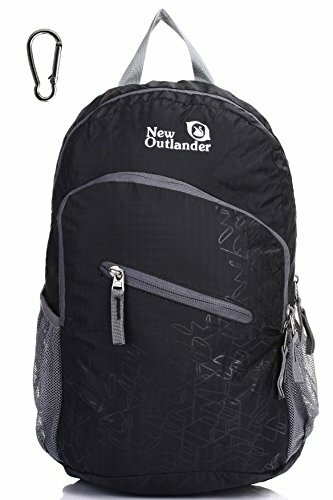 The backpack gives you nice organization options and has three zippered compartments with a main compartment. You may store the bigger items in the large main compartment and use the outer pocket for the smaller personals. Keep your valuable essentials in the inner zippered pocket and the side mesh pockets for some water bottles or umbrellas. The pack folds great so you may easily store it when not in use. Despite the minor issues, considering the money you’re paying, the backpack is a good option for any tight budget. 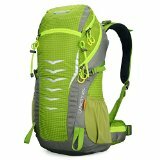 A good option for a low budget is also the 20L/33L- Most Durable Packable Lightweight Travel Hiking Backpack Daypack. The pack comes with one main compartment that is pretty large and two front zippered pockets for some smaller essentials. The internal zippered security pocket works for storing the more precious essentials and you should use the two side pockets for some umbrellas or water bottles. Made with rip and water resistant nylon fabric, the backpack is lightweight and is going to serve you well for a good amount of time. It’s also reinforced in many stress points with bar taking for longer lifespan. The zippers match the durability of the build and are made with abrasion resistant SBS metal. They have a 2-way design and are placed all over the backpack, for easier and faster access to your items. The straps are well made and the ventilation is effective. The backpack folds into a zippered inner pocket so you never have to worry about where to store it. Even though this doesn’t count much for a dedicated hiker, the backpack also looks rather nice. It folds flat for an easy store when not in use. No matter the cons, for its build, lightweight and good storage options, the backpack is a good option for any fixed budget. 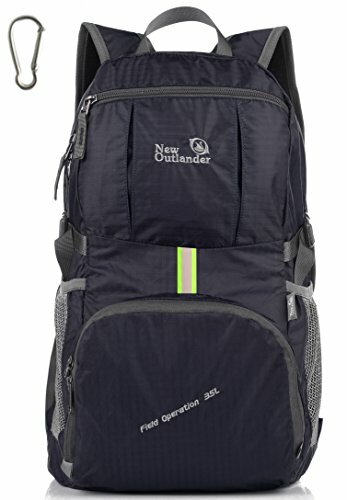 Low priced, yet pretty dependable for any day hikes, the Outlander Packable Lightweight Travel Hiking Backpack Daypack is one popular daypack that you should try on your next hiking trip. The daypack makes a good impression on the durability and its stress points are reinforced with bar tacking, therefore the pack gets more durable. The zippers are made with abrasion resistant SBS metal so they’re also pretty durable. The 2-way design is great and makes the pack so functional and easy to access from all sides. We also like the pack as it’s lightweight and large, offering a good organization space for your belongings. The design is pretty much classic and the pack has one main compartment, two front zipper pockets and two side pockets that you may use for some water bottles. The daypack is made with rip and water resistant material that may handle a light rain. The new version of the pack also features aluminum carabineer, reflector, and whistle buckle. The whistle buckle is placed on the chest strap that keeps your pack secure and in place, no matter how much you’re moving. You can definitely use the carabineer clips to attach some small gear. The shoulder straps are adjustable and breathable so you don’t end up your hike all sweaty and tired. The pack also folds into a zippered inner pocket so the problem of storage and carry is very easily solved. Even though this isn’t a must on a hiking pack, it’s worth to mention the pack has a nice look. Despite the minor issues, the daypack manages to be a reliable option and quite a bang for your buck. 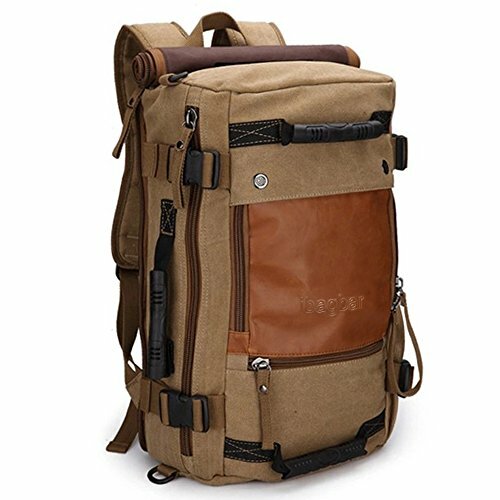 Just because it’s not the typical hiking daypack, doesn’t mean you shouldn’t give the ibagbar Canvas Backpack Travel Bag Hiking Bag Camping Bag Rucksack a chance if ever in need. Made with 90% high density canvas and 10% PU leather, the daypack comes with many features that work for any day hike. Its nice appearance isn’t its only feature, as the pack is also long lasting and functional. The organization options are well thought out and you may organize your items in the main zip pocket, the one side mesh pocket and the 2 front zip pockets. The laptop compartment is large enough to accommodate a 15in laptop and to protected very well. What we also like about the pack is its versatility as the pack works not only as a day hike pack, but also as a brief case or duffle when travelling. After all, the straps are placed in a hidden compartment so you may easily carry it as a satchel or rucksack. The shoulder strap is detachable and you may easily turn the pack into a messenger bag. The pack has a tough build and leaves a durability feel. The shoulder straps are well padded so the pack is comfortable even after a long day. On top of everything else, the pack is made with material that is thick enough to protect your personals on a light rain. All things considered, the pack is dependable, comfortable and nice looking, which may be enough for many. Even though it’s made of nylon, the Osprey Packs Daylite Daypack is tough and handles the intense use pretty well. The daypack is lightweight and it gives you nice storage spaces for your items. The main compartment is quite large and the side pockets are made with dual stretch mesh. The front zippered pocket has a mesh organizer and a key clip so you may win more storage options. The main compartment is quite easy to access through the large zippered panel. The pack also comes with a multi-function interior sleeve that may fit a tablet or an Osprey hydraulics reservoir. It’s also expandable and you may attach it to some Osprey larger packs. The back panel is mesh covered and made with die-cute foam so it’s not only comfortable, but also presents effective ventilation. You’re not going to end up your day hike all sweaty, for sure. Or, at least, not because of the pack, anyway. The pack is well made and a sure buy. Despite the cons, it goes without saying that the pack is still a great choice for day hikes, no matter how picky you may be. 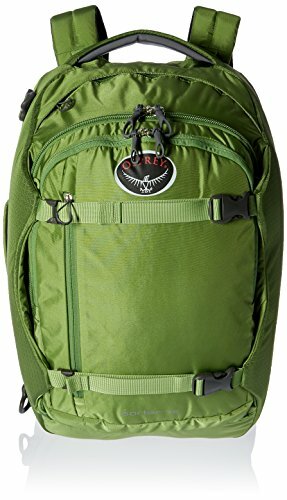 There’s nothing typical about the Osprey Porter Travel Backpack Bag, 46-Liter, except for the fact it’s comfortable and ready to handle your day hikes, for quite some time. The daypack is made with 420D nylon hex rip and 420D HD nylon which means it can definitely take some heavy use. The organization on the pack is great as the design is well thought out. The backpack presents a zippered top accessory pocket so that it’s not difficult for you to access your personals at any time. There is also a secure entry to your items and the main compartment has a panel load lockable zippered access. The internal mesh zippered pocket is great for some valuable items and don’t forget to use the internal fabric zippered pocket as well. You may also attach some items by using the four reinforced cord loops. The straight jacket is useful for compressing your load and the side walls are well padded for increased protection over your things. The shoulder harness is padded and has a stow-away design, whereas the sternum strap is great and easily adjustable. The pack also comes with a whistle buckle, so you feel safer when out on the road. Nevertheless, the pack is still versatile, comfortable and well built, which should seal the deal for most of us. 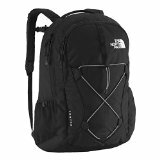 You may be feeling like paying the extra buck on The North Face Recon Backpack but it’s not going to take long to realize the pack it truly worth it. The list of good things begins with the material as the pack is made with 210D Cordure nylon mini-rip stop. This means the pack is able to handle more difficult conditions, for quite some time. When it comes to comfort, we don’t have any comments to make. After all, the pack features the FlexVent suspension system consisting of the injection-molded shoulder straps and the padded mesh back panel. The spine channels on the back panel improve breathability, therefore your comfort as you move. As for the storage options, it’s important to mention the pack comes with a padded, fleece-lined laptop sleeve that easily stores your 15in laptop. A padded, fleece-lined tablet sleeve is placed in the front compartment and you have easy access to your gadget at all time. We also notice the front stash pocket with stretch side panels and the internal organization of the secondary compartment. The fleece-lined media pocket adds to the list, but you may also write down the secure zippered pocket and elastic webbing for cord use. 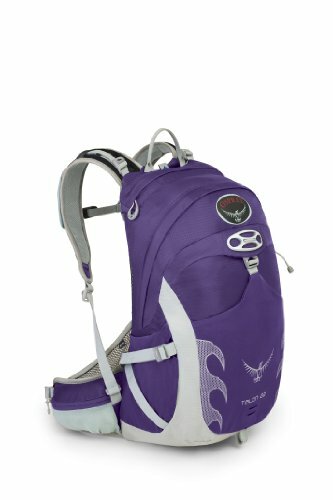 The pack comes with an adjustable sternum strap and a removable waist belt so it’s comfortable to carry the pack all day long. For what it’s worth, the pack is dependable, comfortable and a good investment of your money. 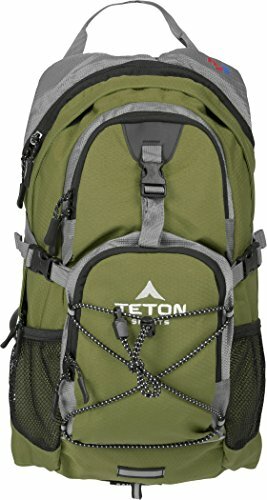 For those of you who like hiking and have their mind set on a daypack that comes hydration ready, a very reasonably priced and dependable choice is the Teton Sports Oasis 1100 2 Liter Hydration Backpack. The backpack includes a BPA free 2-Liter hydration bladder and a long tube. The bite valve seems to be well made and even if you may feel a plastic taste in the beginning, you should give it a couple of days until it fades away. The kink-free sip tube is lightweight and the bite valve features also a push-lock, for safer use. The 2in opening for ice is large and the bladder isn’t difficult to clean when in need. Apart from the fact it comes with a hydration bladder, the daypack comes with several other features. It has a low profile and gives a nice fit to many. The straps feature high-density notched foam stabilizer and mesh covering, which makes it more comfortable for long time use. The mesh straps are wide and feature breathable foam, working so well with the chest shock absorber. The storage space is good and pretty well organized. The pack features a large pocket with hidden-teeth zipper and the bungee cord system is great for attaching a bike helmet. We also like a lot the butterfly opening for jackets and the weather guard for protection. The daypack has a low profile and you may easily adjust it on the shoulder, chest and waist, for best fit. It’s well made and you can barely see its seams. We’re focusing on the goods though and see the daypack as a reliable, comfortable and dependable option for your day hikes. 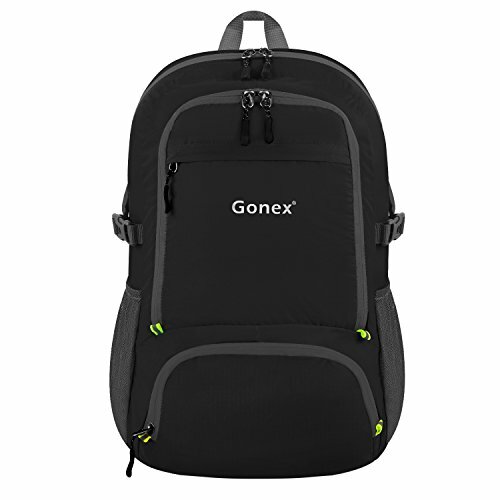 The style and colors of the Gonex 30L Lightweight Packable Backpack Handy Travel Hiking Daypack make it such a good choice for both hiking and travel. The 30L capacity of the pack is enough for some day hikes, whereas the several compartments design keeps your things well organized. The pack features a large front pocket and a money pouch that isn’t difficult to access either. It also includes two nylon mesh pockets on the sides so you can carry some water bottles. As for the more precious items, don’t hesitate to use the inner zip pocket. Made with breathable mesh, the shoulder straps are quite comfortable and the entire pack is made with water and rip resistant nylon. The waist strap is useful and increases your comfort, balancing better your load. We notice that the stress points are reinforced with bar tacking, which extends the lifespan of the pack. The zippers are also pretty good and they’re made with abrasion resistant SBS metal. 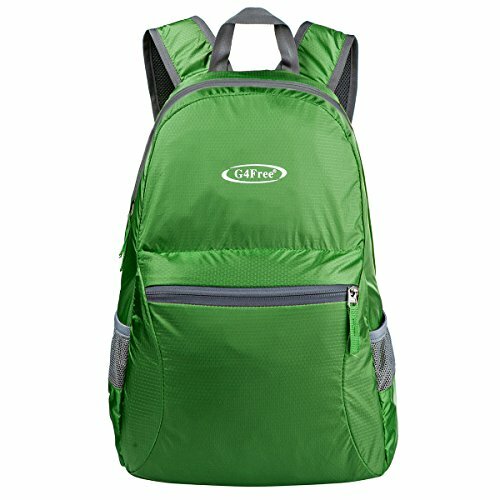 They’re a 2-way style and placed well across the daypack so it’s easy for you to access it from all sides. No matter how you see it, we still think the pack is versatile, dependable and comfy when hiking or travelling as well. Going shopping for a good hiking daypack when you only have a few bucks in your wallet is no fun, but this doesn’t necessarily mean you have to come back home empty handed. 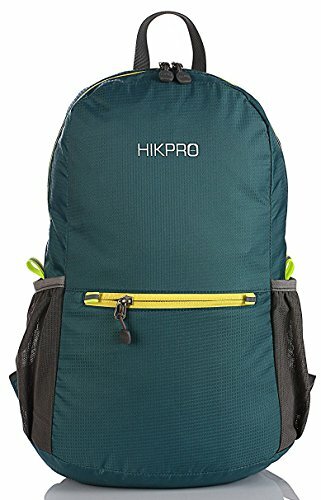 Small and dependable, the Hikpro 20L Ultra Lightweight Packable backpack is large enough though to give you plenty of storage space for all of your essentials when day hiking. The daypack has an efficient organization of the space and you may easily put in order your things in 3 zippered compartments and one outer smaller pockets. The main pocket is useful for the larger items, whereas the inner zippered pocket may great for some precious documents. Don’t forget about the 2 large size mesh pockets that may accommodate some water bottles. 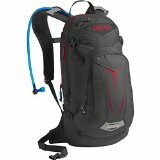 Altogether, the daypack has a 20L capacity which is enough for a day hike. The build and materials of the pack are good and the material is water and tear resistant nylon. The zippers run smooth and take the abuse, as they’re made of abrasion resistant SBS metal. As for the build, the reinforcements with bar tack process in 14 places make the daypack able to take a beat. The comfort is good and the day pack features well-padded shoulder straps. Let’s not forget about the portability of the daypack, when not in use. the pack easily folds into a small pocket so it’s a breeze to throw it in your carrying case. Like it or lump it, but we still stand by the pack as it’s low priced, dependable and easy to use on any day hike. 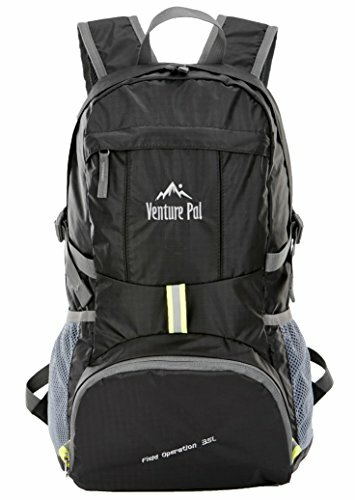 In order to understand the popularity of the Venture Pal Lightweight Packable Durable Travel Hiking Backpack Daypack you only need to take a peek at its detailed description down below. The daypack is made with tear and water resistant materials, handling the intense use quite well. It features a double-layer bottom piece which extends its lifespan and bar-tacks at the essential stress points. These manufacturing details make it stronger and able to take the heavy duty use. 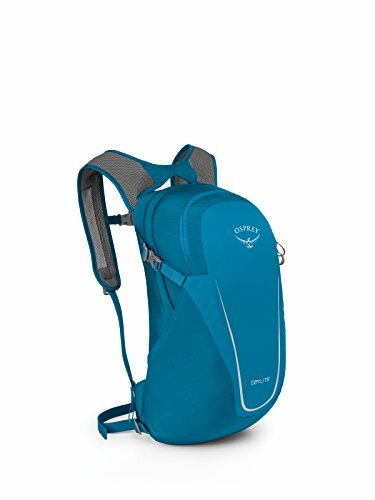 The daypack is very easy to use and comfortable as its shoulder straps present some fine cushioning and effective breathability. the sponge padding minimizes the effort in your shoulders and you can always adjust the straps for better fit. The chest strap balances better the weight of your load and the whistle buckle is a nice and useful design detail. The two-way SBS metal zippers work well in most cases and it’s great that you may open/close them from any side. As for the organization, the daypack is quite a treat and you may store your essentials in the main zipped compartment or the two side pockets. You can also fit in some other things in the two zipped front pockets, just that you know. And in case you’re wondering about the capacity, the pack has a 35L capacity for the main compartment and two separators for more efficiency when organizing your essentials. Last but not least, the pack folds into its own pocket so you may take it along when travelling abroad. Suffice to say, the daypack is lightweight, well organized and saves you in most of your day hikes. What would you want more? 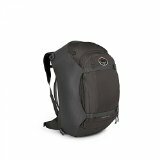 The Lowepro Photo Hatchback 16L Camera Backpack – Daypack Style Backpack is a good solution if you’re planning to hike and capture the nature’s beauty with your professional camera. The backpack has a sleek style and you may organize very well the multi-functional compartments. You shouldn’t worry about your camera as its designated box is padded, but also removable when you’re not needing it. The storm-flap closure makes access easy too. The pack comes with a grab handle and you may easily turn the pack into a hiking daypack. the access to the camera is always easy and fast thanks to the hatchback opening. The font padded stash pocket ensures quick access to the dual compartment that is large enough to fit your tablet or laptop. The back pad is mesh-covered, which means a softer surface for your back, but it’s also breathable so you don’t end up your hike all sweaty. The stretch-mesh side pockets are tall and big enough for your water bottles. The upper compartment comes with a zippered pocket and is quite big. It also features 2 stretch mesh pockets and built-in key fob. On top of everything else, the pack comes with an All Weather cover that protects your essentials from the elements. Our last thought is that the pack works great for hiking and carrying your camera too, but you should cut it some slack over its flaws. 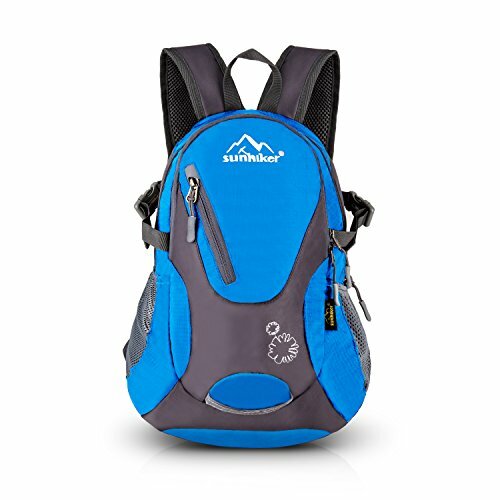 When you take a look at the Sunhiker Cycling Hiking Backpack Water Resistant Travel Backpack Lightweight SMALL Daypack, you should cut it some slack. Even though it’s small, the backpack is lightweight and easy to rely on when day hiking. Its shoulder straps are easy to fix for the best fitting, whereas the waist and the chest strap balance the weight of the load, taking into the hips and protecting from pain your back and shoulders. Additionally, the straps are breathable and comfortable. The volume control system is effective so you can get some control over your load. The Mat reflective stripe on the backpack makes it more visible, increasing your safety while on the move. The backpack features bottle holders on the sides so you may easily carry some water while hiking. It’s made with highly tear and water resistant nylon, taking a beat. The zippers work well and everything about the pack has a durability feel to it. Getting the ducks in a row, the pack is well made, resistant and a wise buy for the day hike gear. Even though most of the hiking daypacks out there are lightweight, some are even lighter than expected, without compromising on the durability or reliability, though. 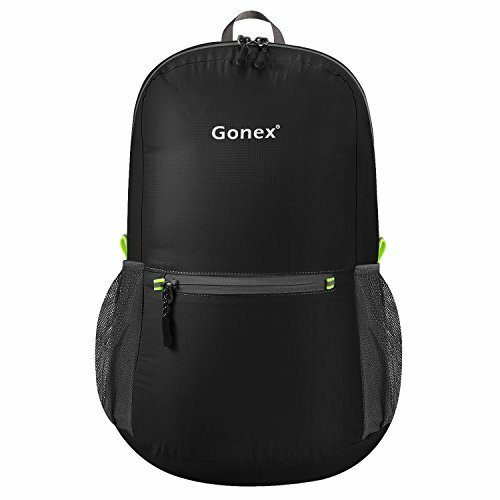 It’s the case of the Gonex Ultralight Handy Travel Backpack, Water Resistant Packable Backpack Hiking Daypack that isn’t just the good size for a day hike, but also amazingly lightweight. Just because it’s lightweight though, doesn’t mean the pack is made with flimsy materials. By contrary, it’s made with tear and water resistant nylon, featuring SBS abrasion resistant metal zippers. Additionally, it’s reinforced in more than 25 places with bar tack process so you shouldn’t question its durability. The space is enough for a day hike needs and you may fit your essentials in three zippered compartments. The main compartment is quite large and it shouldn’t be a problem for you to have the space for everything you need on a day hike. An outer smaller pockets gives you easier and faster access to your essentials, whereas the inner zipped pocket may accommodate your valuable documents. The comfort is also good and the padding on the shoulder straps is enough, considering its size. The straps are also easy to fix for the best setting. It’s not only the padding that increases the comfort though, but the design also. On top of everything else, the pack comes in 8 colors so you may easily choose one that you like best. Lightweight, yet durable, dependable and organizing your essentials quite well, you’re not getting a lemon with this one, for sure. 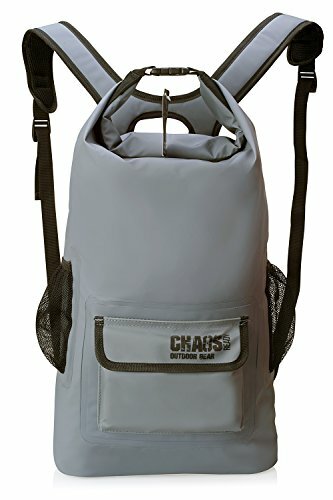 If waterproofness counts the most for you, you should definitely go with the Chaos Ready Waterproof Backpack – Dry Bag – Quality Heavy Duty. The daypack is 100% (Class 3), but this is not the only thing that counts as a plus. The main compartments are made with tough materials that protect your essentials from dirt, dust, sand, and water. You may safely drop it in the water as the pack also floats, being safe for a quick submersion. Made with tough 500PVC tarpaulin, the pack is quite a power horse due to its high frequency welded seams. The durability doesn’t sacrifice its flexibility or comfort though and you may find the pack easy to manage and cozy. As for the cleaning, you simply wipe it clean when in need. The storage options are good and you get easy access to the mesh side pockets and the front pocket also. The front pocket isn’t waterproof and the side pockets match your water bottles. You get also good control over your load thanks to the tightly sealed fold system. You feel comfortable when carrying the pack as the shoulder straps are well-padded. Roomy, tough and, more importantly, comfortable, the pack isn’t to be missed on if ever in need. As long as you’re aiming for a waterproof pack for your day hikes, you’re good with this one. 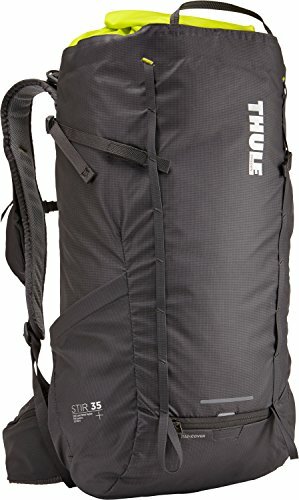 Lightweight and reliable in many situations, the Thule Stir 35 is large enough for a day hike, but doesn’t add too much weight while you’re on the move. The backpack is made with quite tough elastin coated 210D Robic and 70D nylon so it means it’s able to take the intense regular use for a decent amount of time. The features on the hiking pack are plenty and functional and each one of them means more for your comfort and easier use. The pack comes with plenty of pockets and the pocket layout is very well thought-out. The side pockets are easy to access, whereas the small compartments on the belt may store your smaller items. The multiple pouches and the zippered compartments give you not only many storing options, but also a good organization of your items. We also like the adjustability of the pack and the torso is easy to adjust for the perfect fitting. The hip belt is removable and you can definitely try the sternum strap when running some errands in town. The pack is very easy to access thanks to the lid that also features a helpful storm flap. A StormGuard system protects the pack as it combines a partial rain cover with a waterproof bottom liner. You get in the end a hiking pack that is entirely waterproof. The side zipper gives you easy access to your gear, whereas the light loop attachment point and reflective material are important details. The stretch pocket on the shoulder strap is useful when you want to store your phone or other small items. You get more easy access through the front shove-it pocket and you may hang your hiking poles or ice axes with the help of the two attachment loops. The hiking pack is comfortable and has a good built. It’s spacious and lightweight and comes with a rain cover. It looks nice and is dependable. Despite the minor cons, for the all the storing options is gives and the good qualities, the pack is a great choice for your daily hikes. 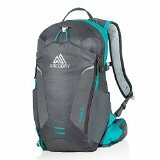 The lighter model of the famous and popular Osprey Talon 22, the new Osprey Packs Talon 22 backpack brings to the table plenty of great features and promises to be at least as popular as the first Talon 22. The backpack is highly versatile and its 22 L of capacity recommends it as a great option for the day hikes, running some errands in town or in case of urban commutes. Going through a detailed look, we see the Biostretch harness and continuous wrap hip belt that create together a very stable carry system. The backpack doesn’t use much material and glue, so it’s lightweight and so much breathable. Despite the weight though, the backpack is durable and takes the daily hikes for a very long time. An amazing feature on the new Talon 22 is the Stow-on-the-Go trekking pole carry system that helps you move easier, while carrying comfortably your trekking pole. Another feature that we really like is the Lidlock helmet, reliable when you want to stop for getting a coffee or have a chat with your neighbor. The backpack is highly adjustable and the hip belts are well placed and zippered for safer carry. You get plenty of space to organize your items and the backpack features side stretch mesh pockets and a harness pocket. The top-lid storage adds to the list of organizing options. The compression/carry straps are lower placed and inside out for comfortable design. They hold securely in place your loads and compress your backpack for better storage. We also need to mention the external hydration sleeve that not only helps you easier refill, but also protects the content of your backpack from incidental spills. The backpack is breathable and cools you in a hot summer day thanks to the precision cut and accordion spread mesh-covered foam ridges. The fit is nice and almost perfect due to the die-cut slotted foam hip belt (also mesh covered) and harness. The hip belt body wrap is seamless for extra comfort and better support as well. The tool loop with bungee tie-offs increase the versatility of the backpack that has a good weight distribution holds pretty well, even throughout the rainy days. Despite the minor cons, considering the impressive list of good things, we’d take the new Talon 22 on a hike any day. This is a 29 liter or 1770 cubic inch daypack that’s lightweight at 2.6 pounds. It’s built from several flavors of nylon for increased toughness. The build and the stitching, the materials and zippers are top quality with a durable feel to them (Tip: here’s how to test a zipper). The Recon features one large main compartment with a laptop sleeve that fits most 15” notebooks (won’t fit a 15.6” one), a tablet sleeve, and hydration port. There is also a secondary compartment with organization for holding the various items for easy reach. The mesh side pockets can hold a Nalgene bottle each, or a hat and gloves, or sneakers, or whatever you throw at them. The pocket on top is fleece-lined to hold things like glasses, cell phone, GPS. The shoulder straps and hip belt have good padding for comfort, and mesh on the inside for better air circulation. The hip belt is removable to make the backpack fitter for carrying around town or campus. The Recon allows for easy organization of your stuff. With two compartments and two pockets, you’re sure to not forget which item is where. Stick a jacket in the front pocket, your breakables in the top pocket, your large electronics and a change of clothes in the main compartment, your smaller items or gear and snacks in the organizational compartment, and you’re good to go, whether in the city or the outdoors. The The North Face Recon is available in men’s and women’s versions. 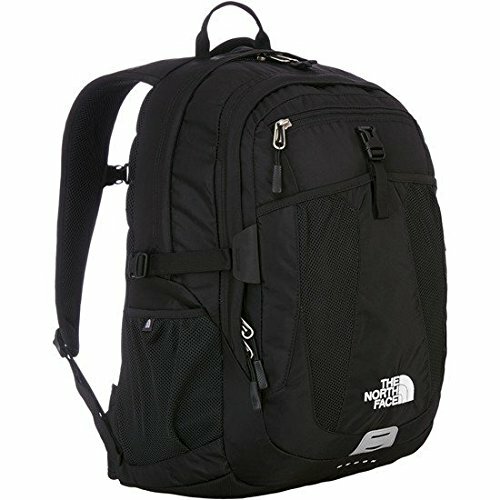 If you prefer a unisex backpack, try the North Face Jester at the same size as the Recon. Or if you require larger, you can’t go wrong with the Heckler. This is truly an Everest-grade backpack, and perfect for day hikes. You’re more likely to get this pack for mountain tours rather than for travel or city carrying. If you travel to a foreign country, you may find the stylish look of the Stratos to be more of an inconvenience, as this is not an inconspicuous backpack. But it’s the great outdoors where it really shines. The main feature of all the models in the Stratos series is the suspended mesh back panel for the best ventilation possible. 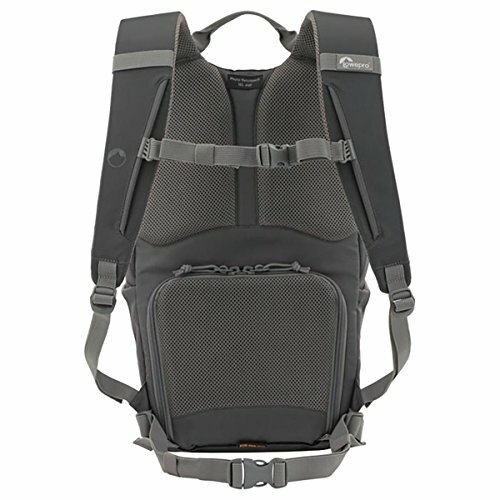 This does not mean simply that the back panel is covered in mesh for better breathing, but that the backpack is actually suspended from your back, with only the mesh touching the back. Feeling the wind on your back already? The shoulder straps and hip belt are also covered in mesh and are made of breathable foam. A neat addition are the side pockets on the hip belt, perfect for storing items that you need on hand. A fairly large smartphone can fit in there well. The hip belt is not removable. The chest strap comes with an emergency whistle attached to it. The Stratos offers a lot of adjustability: top and bottom load compression straps on the front, and adjustable straps on the shoulders, chest and hip belt, to allow you to achieve the perfect point of comfort. While some people may view the lack of many pockets as a con, those who like simple organization will appreciate it. The Stratos series comes in different sizes. The Stratos 24, or the 24 liter version that we’re reviewing weighs 1.1 kg, which makes it lightweight. The sizes in the series however can go up to 50 liters. The 24L and 34L models are panel loaded, but they have a 26L and a 36L brother respectively, with top loading access. The Osprey Stratos is intended for men’s use, although women use it too. However for a women’s-only version, have a look at the Osprey Sirrus. As for price, it certainly won’t break the bank. 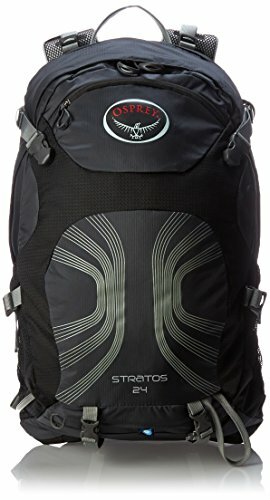 For the features it offers and for being one top daypack for hiking, the Stratos 24 carries one of the best price-quality ratios out there. If you need a backpack to sustain water and mud, then this is one you can trust. It works well in the rainy outdoors, from Florida to the rainforest, if you go out in extreme conditions, and also as a motorcycle backpack. It is 100% waterproof: you can leave it in a puddle, or ride the motorcycle at 80 miles an hour, and will not soak through. 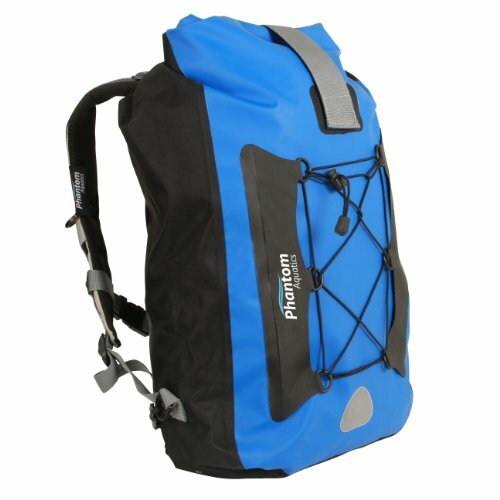 The Phantom backpack is able to achieve this by using a welded seamless construction of PVC coated 600D nylon. There are no other pockets besides the main compartment and one mesh side pocket, and the top gets sealed by folding in on itself three times. The two ends then buckle together or to the sides, and are secured with a Velcro strap that holds the lid in place. You can submerge this backpack, or float on it. If water is not an issue at the moment of your hiking, you can fit a jacket in the bungee cords on the front. There’s an internal pocket as well with a zippered closure, to allow you to store keys, documents or wallet without them sinking to the bottom of the bag mixing in with the clothes. It’s got padded shoulder straps and back panel, with adjustable sternum and hip straps, for snug and comfortable carrying. At 25 liters capacity and 2.4 pounds, the Phantom Walrus Dry Bag is roomy enough to hold your things for a day’s trip, and light enough to be used by men and women alike. It’s one of best waterproof daypacks available on the market. If you’re new at hiking, one of the first lessons to learn is that you need the right gear in order to have the best hiking experience. The better your gear is, the higher the chances for you to really get the hang of it and worry only about how high and far you’re going to get, and not if your gear is wet or not. Therefore, it’s only a matter of time until you find out that you don’t need to carry your rugged, heavy-duty backpack if you’re only going on a day hike. 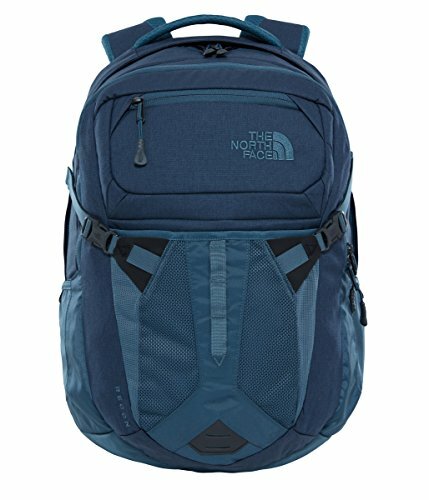 A day pack is going to do just fun and you should definitely get one for a successful day hike. A daypack is supposed to be lightweight and breathable, yet able to give an efficient organization to your personals. Just because it’s lightweight, doesn’t mean that your daypack isn’t supposed to be durable and tough though. Don’t think you need to settle for less, which is why you should keep in mind it also has to be water and tear resistant as well. It’s also nice to have a daypack that is highly adjustable, for the best fit. Its straps should be easy to adjust and pretty well padded too. The market gives you many options and it’s you to decide which way to go and how much money you want to spend for it.